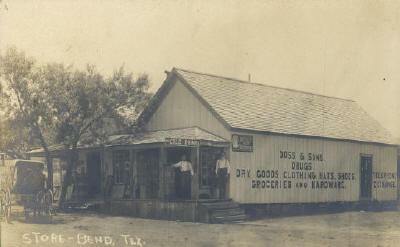 The Story of Bend, Historic Texas, San Saba County Chronicles. In this account of the history of Bend, Texas, it may sound like that my ancestors invented the earth, inhabited it, created Bend, Texas, and hung the moon. It is not my intention to leave that impression, but I can only write what I have heard and learned of them. There are many other pioneer families that contributed to the history of Bend. I will list some of them but I know that I will leave out some. Early family names in the Bend area other than my relatives are: Baxter, Smith, Millican, Cate, Turner, Gibson, Gorman, Marley, Morris, January, Buckhannan, Bearden, Matsler, Byrd, Scott, Lewis, Barefoot, and many more, some of which will be mentioned later. Our story begins in the 1700s in Pitt Co., North Carolina when William B. Moore married Nancy Hardison (widow of Joshua Hardison). Their son, William Moore was born in Pitt Co., N.C. He married Frances Forrest who was born in 1790 in Greene Co., N.C. This couple had six children: (1) Alfred Moore was born in 1813 in North Carolina (More about him later), (2) Martin E. Moore, born 1815, (3) Grove Moore, born 1818, (4) Ruel Moore, born 1827, (5) Mary Moore, born 1833, and (6) an Unknown Daughter, (No other info). Alfred Moore was the beginning of the next generation. He was married to his first wife, Elizabeth Frances Phillips, born in 1814, Pitt Co., N.C. (Her father was Thomas Isaac Phillips.) Their first son was William B. Moore, MD, born 9-15-1835. He practiced medicine at Brownsville, Haywood Co.,Tn. The second son of Alfred Moore was Thomas Isaac Moore, born 1837 in Haywood Co., Tn. Number three son was Seth Martin Moore, my great grand father. (More about him later.) Number four son was John Alfred Moore, born 1842. (One document also lists him as a doctor practicing with his brother W.B. and a half brother, B. Moore, MD.) Then there was a daughter, Frances Moore, born Nov. 22, 1845 and died Sept. 8, 1851. Elizabeth Frances Phillips Moore, Alfred�s 1st wife died Aug. 12, 1849. Alfred Moore was married a second time to Nancy Smith, born 1827 in Tn. They were married in 1850. The first set of children, with the exception of Frances who died young, were brought back into this home and to this second union 5 children were born. (1) Elizabeth (Betty?) born 1851. She was 9 years old according to the Dist.1, 1860, Census. (No other information on her.) (2) Henry Moore, according to the 1860 census, he was 7 and was born in 1853. (3) B. Moore, There is some confusion about his name. He is listed as Ben---, Bennie, & Benonie. His biography simply uses the name B. Moore, M.D. He became a doctor and practiced medicine with his half brothers W.B. and J.A. Moore. ( When Seth Martin Moore wrote his biography in about 1914, he had lost contact with B. Moore and apparently never knew that he made a doctor) (4) Jimmie Moore, (Nothing is known about this person except that he also was mentioned in the biography.) (5) Martha Moore, (Mattie) was listed in the 1860 census as a one year old daughter. Seth Martin Moore wrote of his childhood and growing up in Haywood and Hardeman Counties in Tennessee. (This article has been transcribed and is available under another title) On Nov. 11, 1861, Seth Moore enlisted in the 1st Confederate Cavalry. He served with the famous Morgan�s Raiders. He was captured and and spent time in the POW camp in Douglas, Ill. He was apparently released in a prisoner exchange action and went back to his Cavalry Unit. He was engaged in another conflict and severely wounded. His chin and lower lip was torn away and he was again taken captive. He almost died from his wound but was later released and was discharged in the spring of 1864. (His Civil War activity is also recorded in another article by this writer.) He returned to Haywood County, Tn. At about this time in history the Alexander family came into the same picture as the Moore family. Silas Newton Alexander, son of Silas Alexander Alexander was born July 14, 1814. Silas Newton Alexander Married Marande May on April 13,1832 in Lawrence Co. Alabama. They apparently moved to and settled for a while in Hardeman Co., Tn. where Damaris Frances Alexander was born March 22, 1844. I have not been able to establish where Silas Newton Alexander and his wife lived all that time but they had four sons born before Grandma Damiras. Those sons were: (1) William Robert Alexander, 1833, (2) James Newton Alexander, 1834, (3) John Van Buren Alexander, 1836, and (4) Napoleon Woodson Alexander, (this was Uncle Poe, born in 1842). There is a story which I have not been able to document, about this family living in the Cabot area of Prairie County, Arkansas in 1847 when Silas Newton Alexander was killed in a family feud. William Robert Alexander, the eldest son , apparently assumed the roll as head of the family. The family evidently lived in Haywood Co. Tn. after that. Damaris married Seth Martin Moore, Sept.6, 1865, in Haywood County, Tenn. One document titled �Early West Tennessee Marriages� gives the date as �8-30-1865�. I suspect that the license was obtained on 8-30-65 and the ceremony actually took place on Sept. 6, like Grandma Damaris said it did. Living conditions during their early married life must have been very difficult at the Old South lay in ruin and the economy was shattered. It was a very difficult time to start a family. Their first son, David Franklin Moore was born July 28, 1866, in Haywood County, Tenn. A little over two years later their second child was born. They named her Ella Lorena Moore. She was born August 14, in Haywood County, Tenn. Anyone wishing to share stories, memories or historic photos of Bend, Texas, please contact us.